“Ernestine” was rescued from Woodlawn Cemetery in the summer. 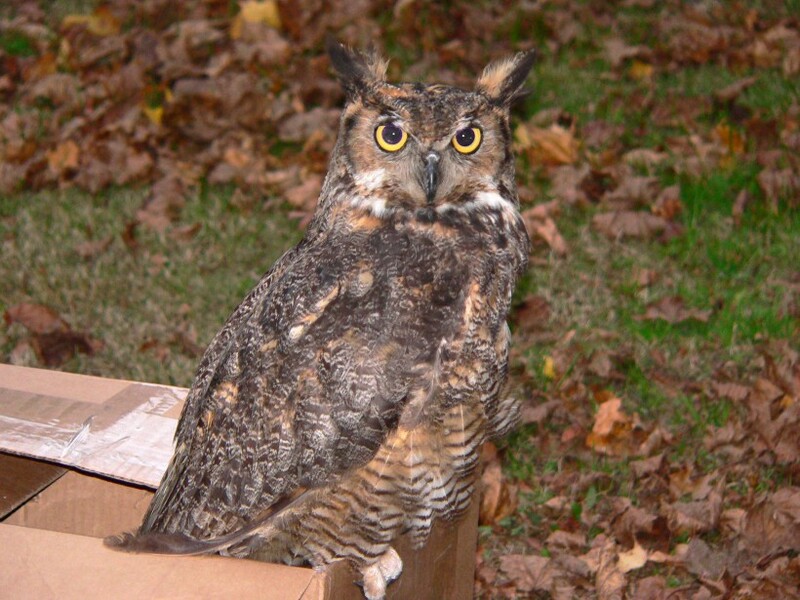 She is a second-year female Great Horned Owl. 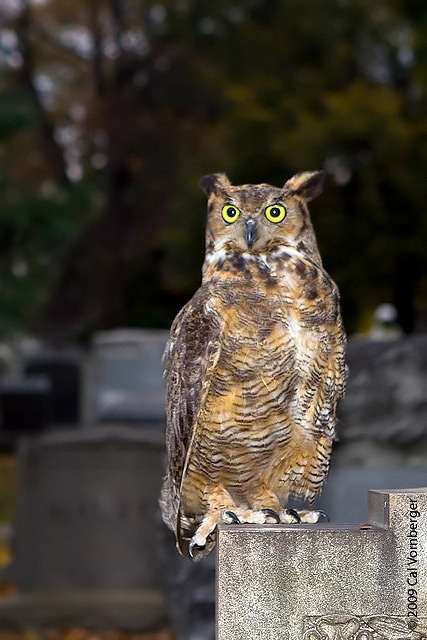 The Great Horned Owl is a year-round resident and is the largest owl we have in the New York City area. Ernestine was lying down on the ground in the cemetery and was easily picked up and transported to the Wild Bird Fund in Manhattan. On intake she was quiet but alert. Instead of viewing us as predators, however, she was docile. Our rehabilitators kept her warm and hydrated overnight while we waited until the following day to take her to The Raptor Trust in Millington, NJ for treatment and recuperation. The Raptor Trust did many toxicology tests and ultimately determined that Ernestine was suffering from West Nile Virus and would have died if she had not gotten help. After recovery from West Nile Virus, The Raptor Trust noticed that she might have damage to her eyesight – probably from a fall during her previously weakened state. She saw an ophthalmologist who found that she had mild retinal scarring, which makes her slightly compromised, but her home in Woodlawn Cemetery is a supportive situation where she’ll have easy hunting of mammals and rodents, and won’t have to deal with the usual city hazards. The Wild Bird Fund was extremely fortunate enough to be able to return Ernestine to her natural habitat. By the fall, Ernestine was brought back to the spot where she was found many months prior. During the car ride the Bronx, she was fighting to get out of the box and was, thankfully, not the docile creature that had been brought to us. When the box was open, Ernestine took a few moments to gauge her surroundings, posed for a few photos atop a gravestone, and then flew up into her tree. We wish Ernestine a long, healthy life in Woodlawn Cemetery! Though we loved contributing to her recovery, we do hope she never has to see us again.